All of the leading gold mining stocks have surged higher over the past week. The popular Market Vectors Gold Miners ETF (NYSE:GDX) has rallied higher by over $6.00 since January 25, 2012. This is a very fast move in such a small span of time. Whenever an equity rallies this quickly it will usually need to pullback or consolidate before moving higher. 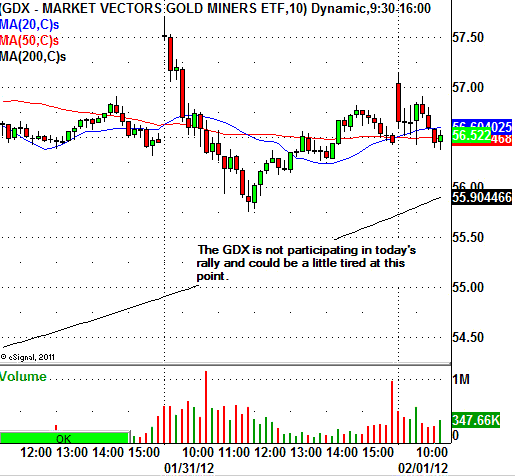 Traders can easily see that the GDX has been halted by the daily chart 200 moving average. Leading gold mining stocks such as Randgold Resources Ltd (NASDAQ:GOLD), Royal Gold Inc (NASDAQ:RGLD), and Gold Corp Inc (NYSE:GG) are looking very similar to the GDX. These leading gold mining stocks will most likely need to consolidate at this time. Once these stocks can base or consolidate for a while they could be possibly bought again. But I Thought . . .